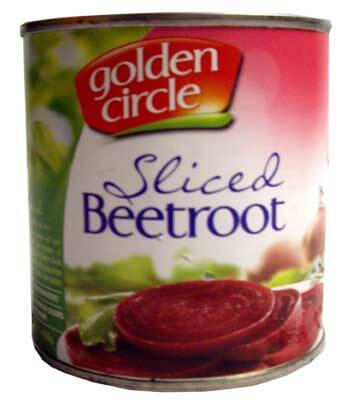 Golden Circle Sliced Beetroot. Slices of juicy beetroot, perfect for in sandwiches, burgers, salads and barbeques. Beetroot is fat free and a good natural source of fibres and antioxidants. Beetroot (62%), Water, Sugar, Food Acid (Acetic Acid), Salt, Herb and Spice Flavours. Whenever I come back from home, a couple of tins of these are in my suitcase. So I'm so pleased to find that I can get them direct, to my door, from SANZA. Much cheaper than an airfare too!